What is SPM and AFM? What is the use of AFM? What do you offer for AFM research? What are chip, cantilever, and tip? Are your products compatible with ...? Can I test your probes before deciding what to buy? Do you offer boxes with different types of probes? I have a question the FAQ doesn't answer, where can I send it? The silicon used to manufacture the cantilevers, is it polysilicon or monosilicon? What is the crystallographic orientation of your rectangular cantilevers? What is the Young's modulus, shear modulus (modulus of rigidity) and the density of silicon? What is the resistance of Si cantilever without coating? What probe coating options are available? How thick is the native SiO2 layer on the tip? What is the purpose of reflective coating? What is the exact influence of the aluminium coating on the natural frequency of cantilever? How would it differ from the same cantilever, uncoated? Do you offer probes with wear resistant tips? Do you offer probes with very sharp tips? We measured the resonance frequencies of some your cantilevers. The problem is that they are quite different from the specified frequencies. Would you tell me how to get the correct resonance frequency? I am running natural frequency experiments on your tipless cantilevers and I am seeing increases or decreases of 20 to 50 Hz of the resonant frequency occasionally. What is the reason? What is the meaning of the different cantilever types: A, B, C ...? What is the number of cantilevers in the standard package? Should I break off the cantilevers I don't use? I am going to image _____ in _____ mode. What probes should I use? I would like to do nanolithography by scratching a silicon surface. Does your company produce any contact mode tip coated with a hard material? I would like to improve the resolution in light tapping mode. Could you recommend me probes for this purpose? Do you have probes suitable for tapping mode in liquid? I would like to estimate tip radius of the probe. What do you recommend me for this purpose? What is the shelf life of the tips with Co-Cr coating? How can I clean my grating calibration samples from some contaminations like dust and other particles like that? Since November 2012 all MikroMasch SPM probes are being manufactured with the new HQ (High Quality) AFM probe technology. The pricing is kept at the same inexpensive level that our customers appreciate for many years. HQ is the next generation of MikroMasch probes distinguished by its high quality and high repeatability of characteristics. In particular, the probes have much more consistent reflectivity of uncoated cantilevers, tip radius and quality factor compared to our former standard probes. The HQ probe chips have cut corners that allow them to be used at an angle from the vertical. The nominal characteristics of the new high quality HQ probes are kept the same or as close as possible to the former standard MikroMasch product line. Please, check out our screencast on High Quality Line SPM Probes here. The order codes of all AFM probes are changed adding an “HQ” in front of the former order codes to reflect this significant improvement. Certain products are replaced with completely improved product versions. *In 95% of the cases. Tip coatings increase tip radius. AFM (Atomic Force Microscopy) is a widely-used instrument and technique for non-destructive surface investigations as well as for surface modifications at the nanoscale. Besides topography, AFM is capable of collecting information that relates to local material properties such as adhesion, stiffness, elasticity, conductivity, coercitivity, etc. The principle of AFM consists in registering the force experienced by the probe from the sample as the probe scans its surface. There are other scanning techniques like STM or NSOM, where the probe is designed to register other physical values. All these techniques and instruments are referred to as SPM (Scanning Probe Microscopy). So AFM is a part of SPM. AFM is a widely used technique in life science, chemistry and materials research, where the structures and processes at micro and nanoscale are of interest. MikroMasch offers AFM probes and test structures. The probe is a key part of any AFM experiment. One of the most important characteristics of a probe is its sharpness, that determines the resolution. Extremelly sharp probes with subnanometer radius can provide true submolecular resolution in ambient conditions. Any probe also have to provide means to transfer the force signal to the AFM system. The test structures provide means to check the system performance in many aspects. In combination with special techniques, the test structures can be used for calibration purposes. Basically a chip is a relatively large piece of silicon to which one or several cantilevers are attached (see Fig.). Cantilevers (or just levers) are thin beams of silicon or silicon nitride. They usually have rectangular or triangular shape and well-defined mechanical properties. Finally, a tip is a very sharp protrusion at the end of a cantilever, although cantilevers themselves are often referred to as 'tips' as in 'contact tips', for example. Our products are compatible with the microscopes of all major SPM manufacturers, including Bruker (Veeco, Digital Instruments, ThermoMicroscopes), Agilent, Asylum Research, JEOL, PSIA, Burleigh, and others. Note that to use cantilevers in ThermoMicroscopes SPM you need to mount them first. The dimensions of the chip are 1.6 mm x 3.4 mm x 0.3 mm. If you want to order our probes, we will ship them to you. We still await our first order from Antarctica. Other than that we receive orders from pretty much everywhere around the globe. You can place an order directly online through our online store. Alternatively, you can call or email our distributor closest to you. Here is a list of our distributors. Certainly! Call us today to help you identify the most suitable probe for your application and we will make sure that you can test it before you buy it. Mikromasch Mix&Match box is available for those of our customers who want to make their custom selection from a variety of different probes in smaller quantities while still making use of the huge built-in discounts for our large boxes. Selections with 100 to 400 probes are available with discounts of up to 40%. To learn more click here. Please contact MikroMasch tech support team using our request form. We use monocrystalline silicon for manufacturing cantilevers. The sample facing side of the cantilevers is a (100) plane and the cantilevers point in the <110> direction. Our cantilevers are n-doped. The specific resistance of the doped silicon material is 0.01-0.025 Ohm*cm. However, in air, silicon always has a native oxide layer, which is not conductive. You can try to remove it in UHV and use cantilevers in UHV immediately, because in air the native SiO2 layer will grow again very soon. You can also purchase cantilevers with conductive coating like Pt. Our probes are available with different coating options: aluminum reflex coating, gold reflex coating, diamond-like-carbon tip coating, cobalt-chromium magnetic tip coating as well as the electrically conductive gold overall coating and platinum overall coating. The thickness of the native oxide layer is about 1 - 2 nm. What is the purpose of the reflective coating? Reflective coating is deposited on the backside of cantilevers to increase the reflected laser signal and prevent interference of light reflected from the two surfaces of the cantilever (silicon is semi-transparent, so some portion of the incident beam is reflected from the backside, and some from the tip side). The most popular reflective coatings are gold and aluminum. A reflective coating is not used when cantilever already has another type of overall coating (for example conductive). Important! Use uncoated cantilevers whenever experimental conditions may lead to corrosion of the reflective coating. To answer your question, we removed coatings from different cantilevers. Typically, after removal the frequency goes down very slightly. For example, for HQ:CSC17 series the difference in the frequencies of coated and uncoated cantilevers is in the order of 30 - 50 Hz (the fundamental frequency is about 13 kHz). Our HARD series features probes with a thin but robust diamond-like-carbon (DLC) coating that enhances tip life without significantly sacrificing resolution. MikroMasch Hi’Res-C series is a long-term leader among supersharp probes. The diamond-like spikes grown on top of the standard silicon tips have a typical radius of curvature of only 1nm! The cantilever does not behave like harmonic oscillator and its spectrum has additional resonance peaks at higher frequencies. 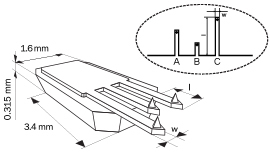 These peaks can be assigned to different oscillation modes of the cantilever or even oscillations of the microscope head. If you use autotune, you probably see a resonance of high order. Try manual tune and limit the range of scanning frequencies. I am running natural frequency experiments on your tipless cantilevers and I am seeing increases or decreases of 20 to 50 Hz of the resonance frequency occasionally. What is the reason? The elastic modulus of Si changes as a function of temperature, which brings about the variation of the resonant frequency. The composition of the atmosphere is also crucial when you are talking about such precision. In the case the difference in gas density and friction influences the Q-factor and the shift of the resonant frequency with respect to that in vacuum. A: Some of our chips have more than one cantilever. In this case, instead of calling them "left short cantilever" or "middle long cantilever" we use one-letter names. The letters by themselves do not have any meaning, refer to the description of a specific series for specifications. The package sizes of our cantilevers are 5, 15, 50, 100, 200 and 400. Not all cantilevers are offered in all package sizes. Please check the available package sizes for the specific model of interest to you on its webpage. It is not necessary. Although you cannot control the force applied by the lever you are not using, in most cases nothing will happen to it and you will be able to use it later (e.g. by realigning the laser). Unfortunately, this important question does not have a simple answer. A lot will depend on the properties of your sample and imaging conditions and there is often a trade-off of some sort. Here are a couple of general remarks. In contact mode soft levers should be used to minimize damage to the sample and the tip. However, very soft levers are noisy. In tapping mode stiff levers are used so that the tip does not stick to the sample surface. Cantilevers with very high resonance frequencies (and force constants) allow faster scanning but can damage very soft samples. Rectangular cantilevers are preferable because they typically have better Q-factors than triangular ones. Basic techniques and recommended types of cantilevers for different SPM applications are described in our "How-to-choose" chapter. We do offer contact mode probes with hard DLC coated tips (HQ:CSC17/Hard/Al BS). However, the coating is very thin in order to keep tip radius low. Therefore, we do not recommend this model for scratching hard surfaces. The best choice will be Hi'Res-C probes, which have a curvature radius of about 1 nm. The choice of the force constant of the cantilever basically depends on the mechanical and adhesion properties of your sample. As the probe is very sharp, it requires special care in use, especially in engagement procedure. Our experience shows that many users break the tips during the first tests. Yes. Try the HQ:NSC36/Cr-Au BS probes. These cantilevers are the shortest and suffer the least dumping forces in liquid media. Corresponding resonance peaks (10 - 35 kHz in water) are clearly seen in a cantilever tune. We produce the PA01 test sample for this purpose. It has pyramidal nanostructures with sharp edges over the surface. The pyramids are triangular with base length in the range 50 – 100 nm and height 50 – 150 nm. The radius of curvature of the sharpest edges is below 5 nm. You also need a deconvolution program. We recommend to use Image Metrology software SPIP available for downloading from Image Metrology. The shelf life of the tip varies depending on conditions of storage. In a desiccator, the shelf life is from half year to one year. When without desiccation, the shelf life will depend on humidity. Generally, it's recommended to use the tips within three months from the shipment date. The best way to get rid of dust particles will be to softly blow on the grating with pure nitrogen or argon. Cleaning organic contamination can be done in consecutive acetone, isopropanol and DI water ultrasonic baths.